Dachshund dogs belong to hound group. There are three Dachshund varieties, which include short haired, wire haired and long haired. 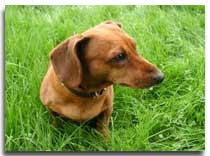 Although Dachshund breed is native of Germany, they have been bred worldwide. Today, the Dachshund is a perfect house pet and companion. He is courageous, lively, clever, loyal, and cheerful. Although this breed won't require heavy exercise, they need controlled diet and regular romps. These dogs were originally bred to hunt badgers and are strong-willed. Most of us think that this miniature breed is easy to control, but for such a small canine he certainly possess lot of power and character into that tiny body. If you're used to larger dogs (Dob, GSD) noted for obedience, this might not be your choice. Dachshund puppies are really stubborn and not too easy to train. But temperament with family members and welcome guests is really stupendous. Among three varieties, long haired variety is calm in nature. These breeds are naturally mischievous and curious. Most of the owners admired the presence of this breed in their home, as these dogs love to be with people. Unfortunately their physical conformation has other effects too. Dachshund s require constant care of skin, as it is lengthier than other hound varieties. In addition to this, these breeds are more prone for fungal infection. Hence if there is any hair loss in a patchy manner over the body, it requires immediate attention. In addition to these disadvantages, the extra spine can lead to back and spine problems. If these dog breeds are provoked, they tend to bite. You should adhere to stringent feeding schedules to Dachshund breeds because they are more prone for obesity. Are you really interested to add a Dachshund to your home? Then, you may need to search for this perfect breed at Dachshund rescue, standard breeders home and your veterinarian's office. If you need a dog with loads of personality, low maintenance companion, or a nice looking breed Dachshund could be an excellent choice.